Abstract. This article describes a new Stata routine, xtcsd, to test for the presence of cross-sectional dependence in panels with many cross-sectional units and few time-series observations. 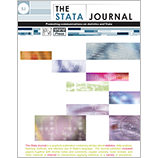 The command executes three different testing procedures—namely, Friedman’s (Journal of the American Statistical Association 32: 675–701) (FR) test statistic, the statistic proposed by Frees (Journal of Econometrics 69: 393–414), and the cross-sectional dependence (CD) test of Pesaran (General diagnostic tests for cross-section dependence in panels [University of Cambridge, Faculty of Economics, Cambridge Working Papers in Economics, Paper No. 0435]). We illustrate the command with an empirical example.